As with the end of every CMON Kickstarter, they've announced when the next one will be. 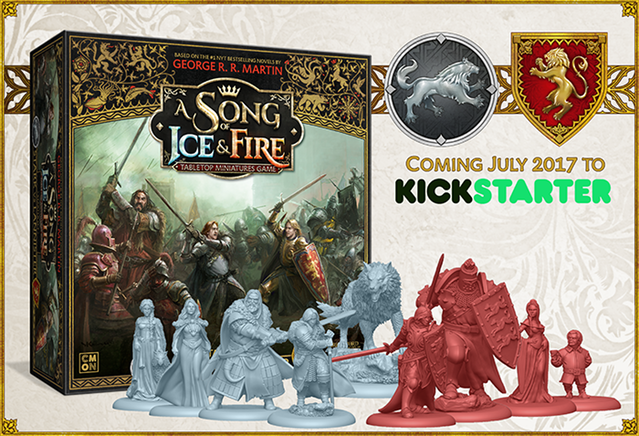 In this case, it's going to be the A Song of Ice and Fire Miniatures Game. And while we don't have the exact date yet, we are being told that it will be sometime next month. So start saving your nickels now. Winter is coming in July as A Song of Ice and Fire: Tabletop Miniatures Game launches on Kickstarter. Whether you’re a fan of the book series or a new visitor to Westeros, you’ll find yourself swept up into the politics and battle of the game. Follow the A Song of Ice and Fire: Tabletop Miniatures Game Facebook page for updates as we march towards war!